In my family, we have a slight obsession with Greek food. I grew up with Greek-Cypriot neighbours who basically became extended family and the culture/food therefore played quite a big role in mine and my sister’s upbringing. We’re always pretty excited about trying new Greek restaurants. When we heard about Suvlaki, we got there as soon as we could. For those of you who are unfamliar suvlaki (or souvlaki, there are different spellings) is essentially meat on a stick, a kebab. It’s a very common Greek dish and traditionally cooked over charcoal, barbecue style. Served on the stick or in a wrap it makes great street food. 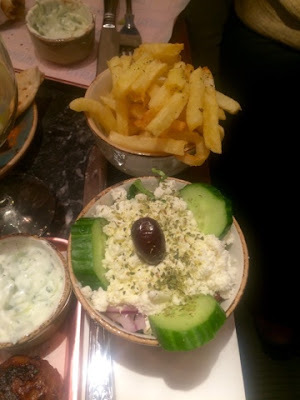 Suvlaki is a pretty tiny restaurant squeezed into Soho’s Bateman Street but absolutely bustling with atmosphere and energy. With limited space, we were really lucky to get a couple of seats without having booked at half past six on a Friday evening. 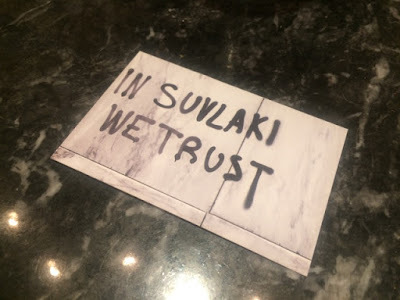 The hostess was really accommodating and friendly asking if we’d been before, if we knew what suvlaki was and needed any help understanding the menu. Even if I am familiar with the cuisine, I always appreciate this as it can be really intimidating when a menu is totally alien to you and you don’t know what/how to order and there’s no one to give you any pointers. Despite having had a chat about the menu and being completely familiar with the dishes, my sister and I still managed to over order! We kicked things off with some nibbles and ordered some olives and tzatziki. 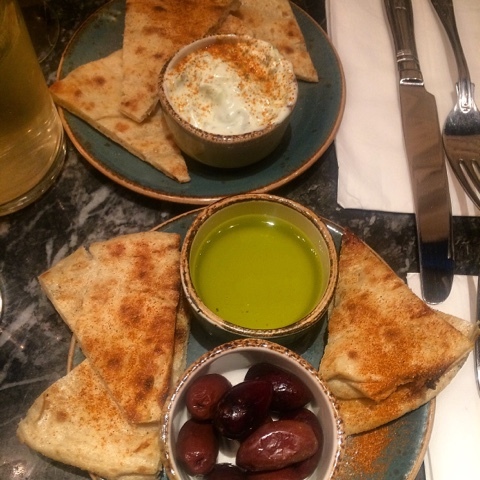 Both came with copious amounts of pita bread and oil for dipping. The tzatziki was brilliant but one of the best things about the nibbles, and in fact throughout the whole Suvlaki experience as it features heavily, was the pita bread. This was not pita bread as we know it here in the UK, this was proper Greek pita bread, it’s even been imported from Athens. My sister was absolutely beside herself over the bread as it was just like the gyros she used to eat from her favourite shop on Skiathos when she lived there for a year. There are various menu options including wraps and burgers, but since I wanted to sample as many of the different suvlaki as I could, I went for the mix and match skewer option. You can get three skewers for £11 from a choice of pork, lamb mince, wild boar sausage, chicken thighs and vegetarian. I had the lamb, boar and chicken. 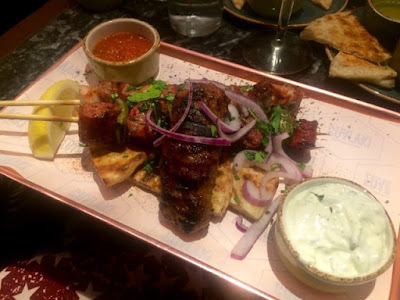 My skewers came with more of the amazing pita bread, tzatziki (didn’t need to order it as a starter) and mild peppery chilli sauce and was garnished with red onion, coriander and lemon. This dish was absolutely delicious. I usually favour lamb but in this case the wild boar sausage, sourced from Mount Olympus itself, was my favourite. Everything was juicy and tender and cooked to perfection. There’s nothing fancy or fussy about this dish, but that’s what I love about it, it’s simple food with great flavours, done well. There’s a short list of side dishes and we had a Greek salad and some oregano chips between us. The chips were cooked to perfection, beautifully crispy on the outside, soft in the middle, infused with the oregano flavour, making them totally moreish. Greek salad was also good, a small portion so you’re not overwhelmed with an enormous side dish and topped with delicious creamy feta. Suvlaki has well and truly shot straight up onto my list of favourite restaurants. The food was delicious and completely authentic. On both tables either side of us there were Greek people tucking into their own suvlaki. It’s always a good sign when people from the actual country are eating in a restaurant, you know you’re getting a good deal. My sister and I have already made a date to go back in a couple of weeks time, so Suvlaki, I will see you again soon!